I’m in the middle of taking a course on Virtual Learning Environments (syllabus here), and reading a few chapters from Adaptive Software Development by Highsmith. It approaches the team-building and collaboration process from the perspective of complex adaptive systems theory, and contains some interesting insights in evolutionary development and creating environments where emergence can occur. I’ve created a summary of a chapter that I’d like to share, as I think it can be valuable for many of us, and specifically for the community of practitioners around the junto concept. As a distributed group of individuals (agents) within a network, we form a complex adaptive system. The key to our success is in creating the environment where emergent, innovative results can occur. 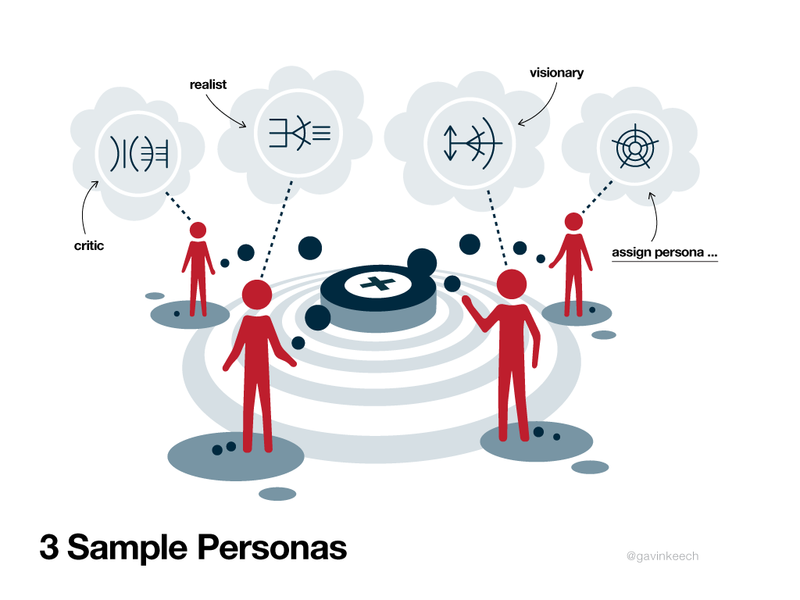 This style works well for organizations that operate effectively by regarding their people as interchangeable cogs in a machine – following specific rules in a predictable environment which is structured hierarchically. An emergent, adaptive group does not exude these characteristics. 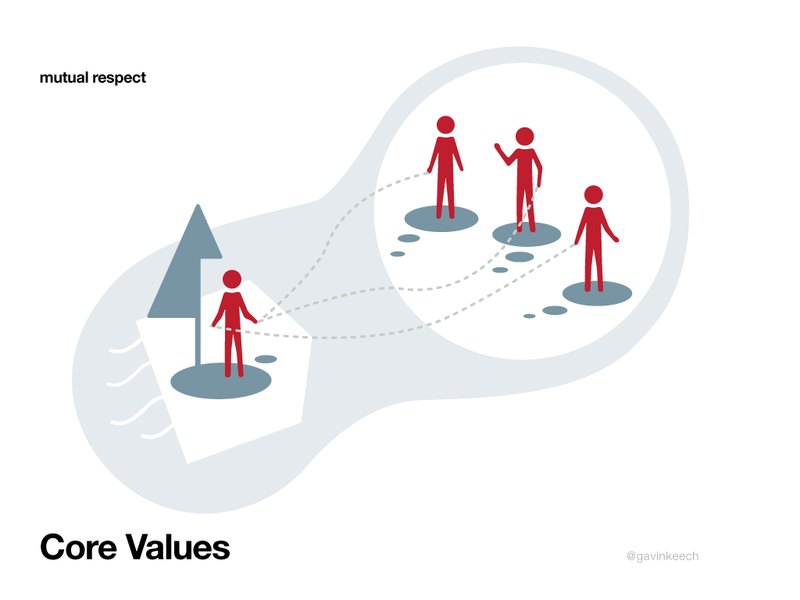 It is a challenge to collaborate effectively, when many of our current organizational models still reward individual rather than group performance. 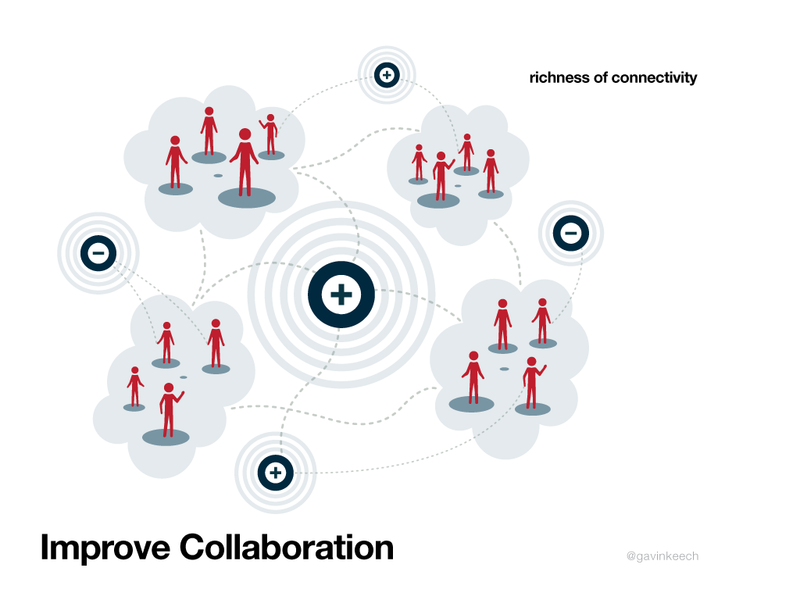 BUT, collaboration is about mutual creation. 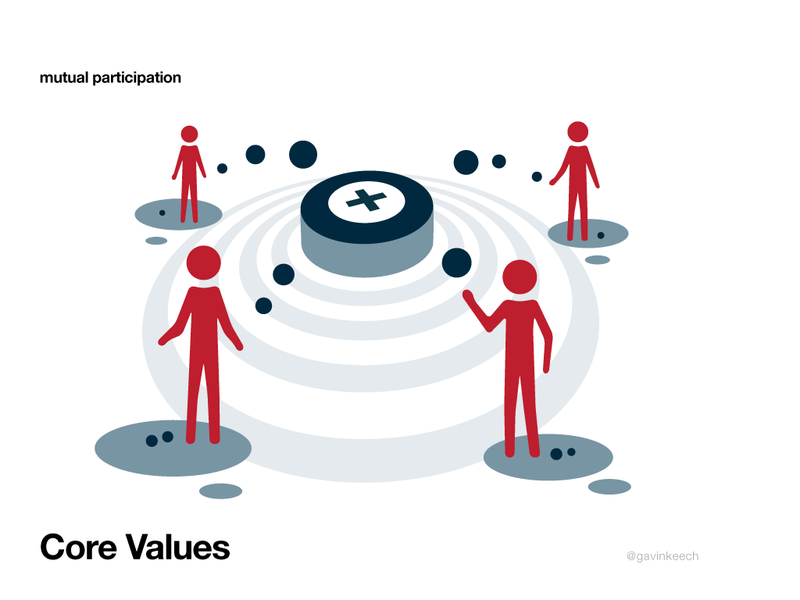 As we design new systems, it will be important to frame the experience in a way that values and rewards productive participation and contribution. Successful, innovative teams are all about the relationships and the right blend of skills – technical, business, problem-solving, decision-making, and interpersonal. They all work towards a common goal, but are alo committed to a deeper purpose. Through the process of building trust, each individual assumes a level of risk that is associated with assuming personal responsibility and mutual accountability. Restriction of the speed of information flow can be detrimental to a team in a rapidly changing environment. 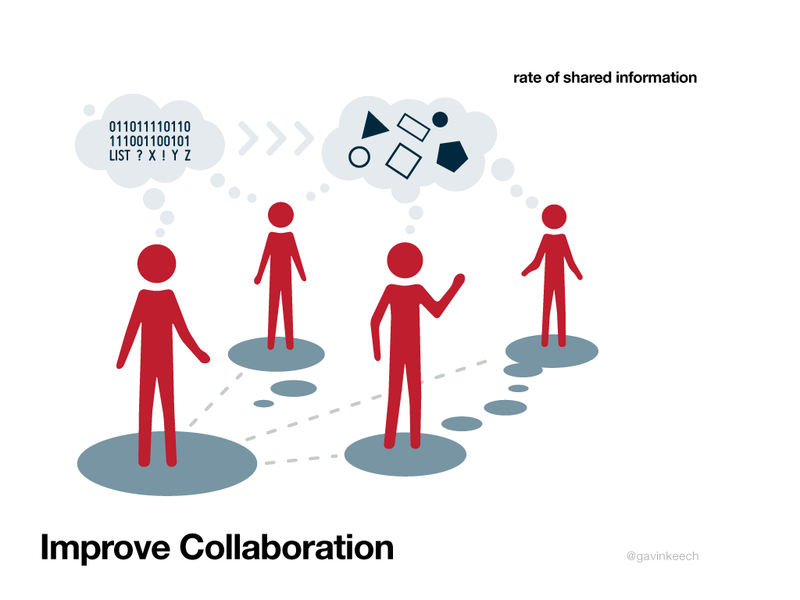 There are two fundamental kinds of interactions the team must differentiate between – shared creation and information transfer. Shared Creation – These are meetings focused on brainstorming, problem-solving, decision-making, or reacting & evaluating (feedback). 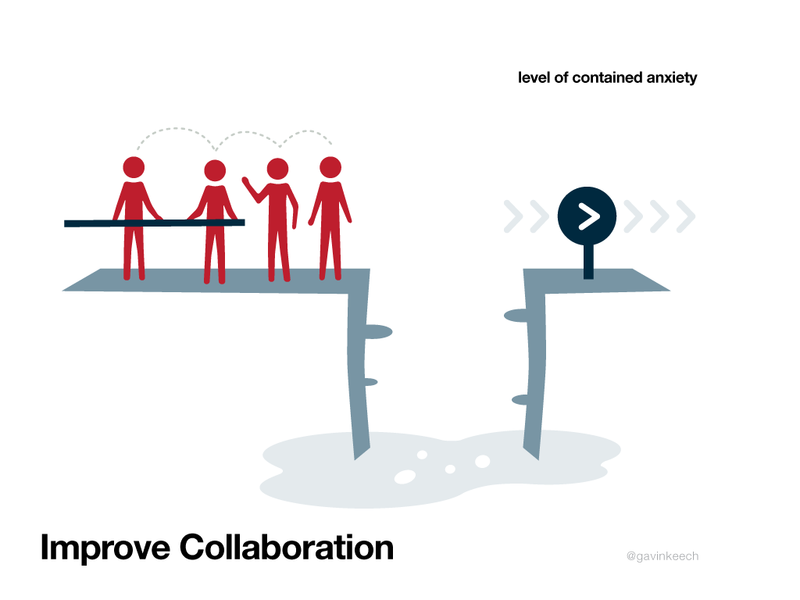 This type of process creates value through active collaboration. Information Transfer – The purpose of these meetings is to inform. The format is reporting and presentation, and the information is not intended to be modified or updated. A diversity of technical skills and experience, cultural and racial backgrounds, personality types and temperaments, business skills and experience, all contribute to a healthy mix in the creative process. 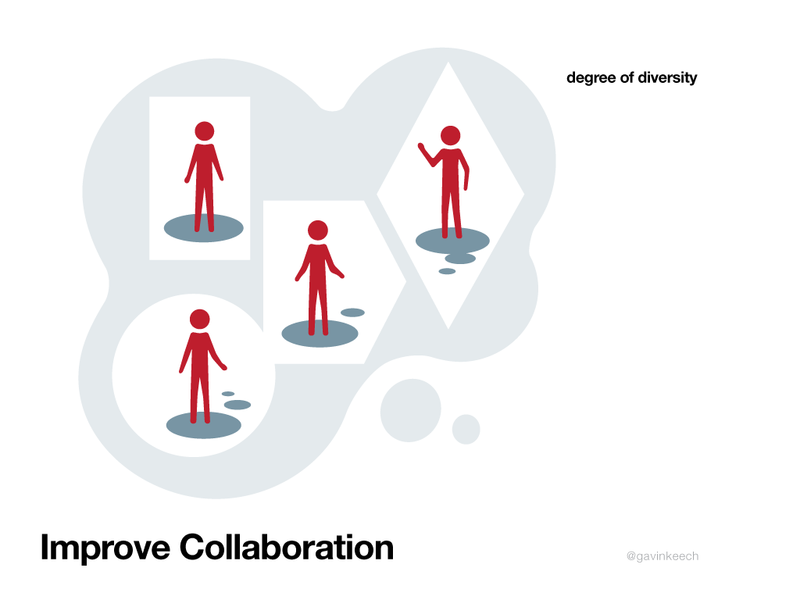 Too much diversity can create issues in creating collaborative environments and facilitating convergence in order to produce results. This refers to both the number of connections between people in a group (“network weaving”) as well as the type of data flow (text, imagery, sound). Increasing the number of interconnected groups increases diversity of information exchanged in problem solving. “Complexity theory supports the view that anxiety is a cauldron for creativity.” Innovative groups are able to strike the balance and ride the edge of chaos, existing between high tension/anxiety and stagnantion/inertia. 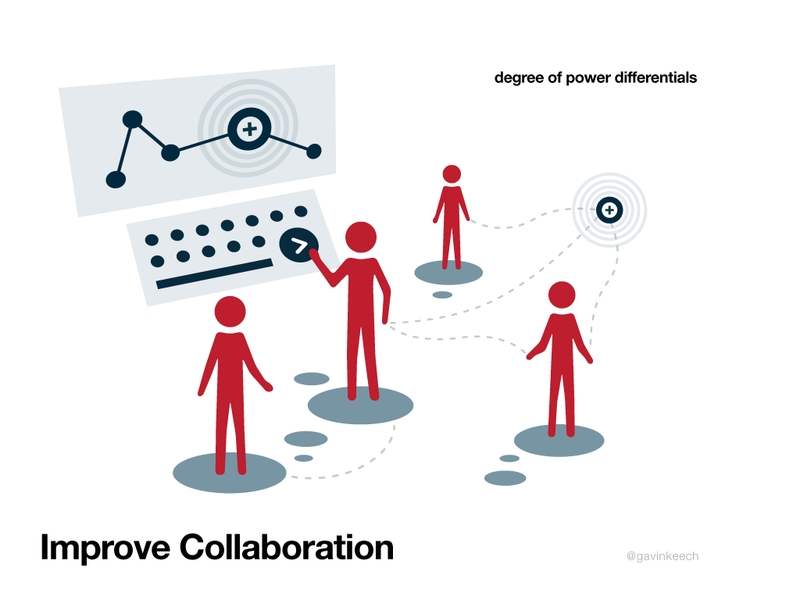 While open collaboration encourages participation and empowerment, it also must find a balance between a Command-Control management style and no leadership at all. 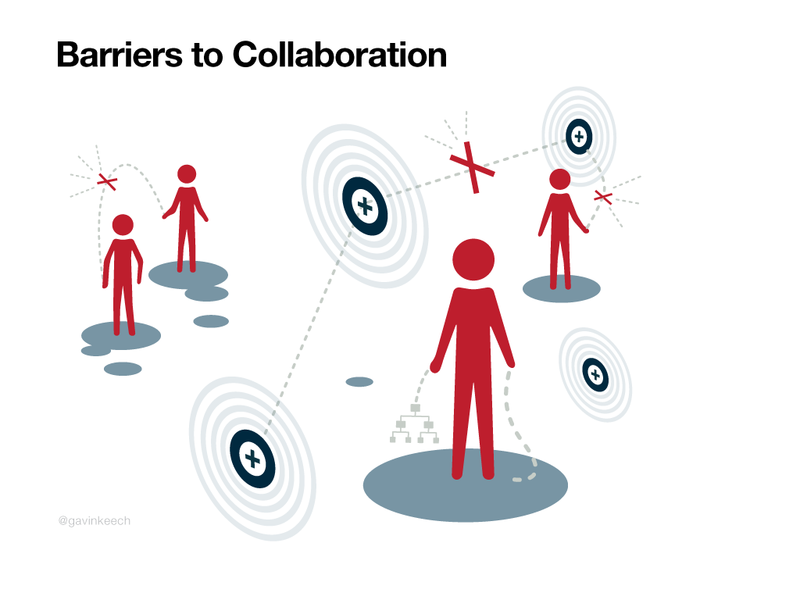 Cooperation in networked environments isn’t about learning how to use “collaboration tools,” it’s about learning how to communicate effectively and resolve interpersonal issues. The beginnings of a conversation may start with everyone wanting to express their own opinions and be heard. As the conversation progresses, individuals make an effort to understand each others’ perspectives, reasons, assumptions, and mental models. Adaptive cycles require teams to make this transition from divergent to convergent thinking in order to form “sustainable agreement” and move forward with deliverables. 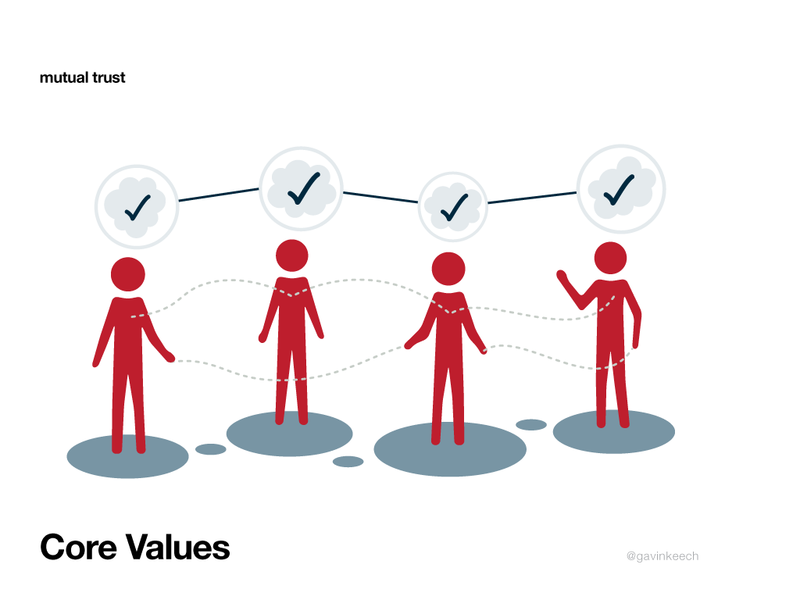 Successful collaboration in a self-organizing team is facilitated when core values are embraced and demonstrated in daily encounters. 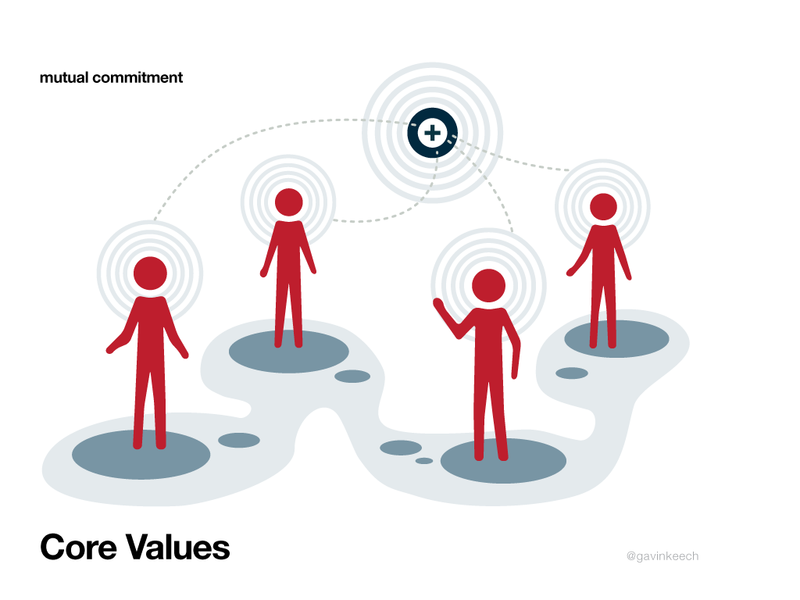 The core values are mutual trust, mutual respect, and mutual participation, and mutual commitment. Trust levels are always in flux, but are built up by “showing respect to others, doing what we commit ourselves to do, being honest and forthright in our dealing, and by not playing politics.” Trust is not a replacement for accountability – others must still be held accountable in order to protect against miscommunication or flawed expectations. It’s easy to full tuned to the people in our group that think like us. The challenge is to value others for their unique contributions, despite our understanding of their area of expertise. Every team member should have the freedom to express themselves, and the commitment of the team to understand that particular perspective. Though every member will not contribute equally, each must have the ability to contribute in key ways. Everyone in the group is committed to achieving the purpose and goals of the project, shares responsibility for making it happen, and owns the result. These sessions are feed-forward rather than feedback, meaning they are intended to solve problems, plan later work, and make decisions. There are four key roles in a JAD session: project manager, participants, facilitator, and scribe. Project managers are responsible for group administration. Facilitators plan the session with the project manager, orchestrate interactions during the meeting, assist in preparing documentation, and expedite follow-up after the session. Participants are responsible for the contents of the agreed-upon deliverable. The scribe documents the session – gathering, organizing, and distributing the results. 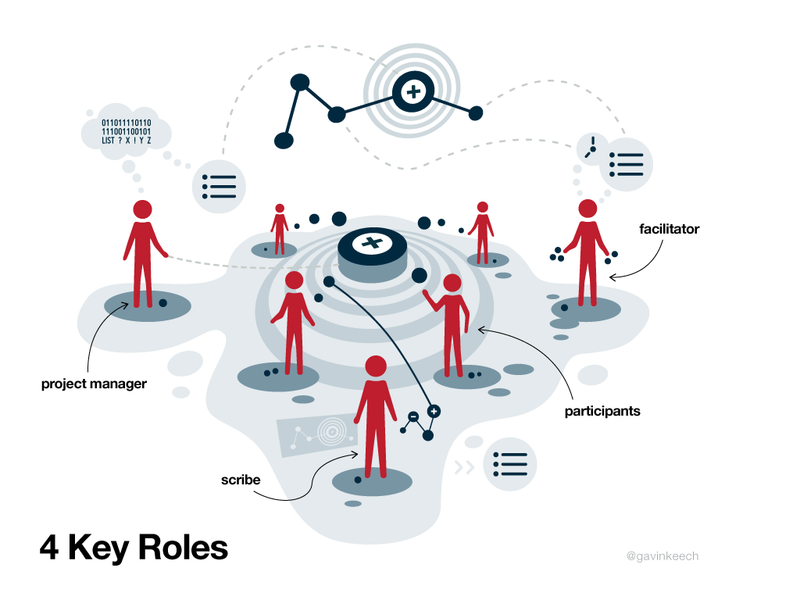 Assuming roles also enhances collaboration, helps team members evaluate mission components, and allows them to experiment with different identity constructs. Role-playing is both fun and sparks creativity. Three sample roles are visionary, realist, and critic. A visionary can switch between many roles and see the big picture, a realist can break things down to their components and form plans of action, and a critic anticipates problems and risks. Each session must have a solid objective and an agenda following that objective, so that participants come prepared to meet the expectations. An example of a contructive JAD session is to explore and define the project’s mission. Another necessary objective is relationship-building, which is crucial for forming emergent environments. More important than any single deliverable is understanding everyone’s mental models. For instance, if the topic is about a product’s “quality,” sufficient time must be spent uncovering and analyzing each person’s view of what that word means. This is a matter of deciding who talks when, and keeping the discussion focused. There must be a “product” at the end of the session that can be archived and available for future reference. Unlike the emphasis positional power common in hierarchical organizations, trust and respect are the glue of an adaptive system. In a self-organizing environment, strong relationships are essential for collaboration. Though the tools may change, confidence in one’s capabilities will carry them through rough spots and challenges. I really enjoyed this overview, and found that we have already come to many of these conclusions through our experimentation and intuition. I’ve been writing for months about the trust-building and relationship-building process in networked environments, and the need to dissolve illusions of the ego and become more open-hearted and open-minded. Much of the information from this chapter affirmed those ideas. I found the section about the 5 “levers” that push teams to the creative edge fascinating, and those control parameters definitely personally resonated with my experience. As we’ve discussed the two tracks for junto discussions – freeform and structured – I saw a lot of parallels between what they called feed-forward and feedback JAD sessions. The suggestion for role-playing in discussions was also aligned with our thoughts on creating roles for discussions, what we defined as host/facilitator, participants, and mapper. I’m really interested now to explore self-definition and roles in this process, and experiment with different combinations of personalities and strengths to see what kind of creativity emerges. A substantial summary and team / leader orientation piece. Thank you, Venessa. Looking at the four types of teams, I find myself musing one innovative process that combines all four in a workable hybrid: Scrum. Unlike the emphasis on positional power common in hierarchical organizations, trust and respect are the glue of an adaptive system. Provide opportunity and means to demonstrate skills and build mutual appreciation within the team. Though the tools may change, confidence in capabilities will carry through rough spots and challenges. Looking forward to a collection of experience reports. i have been thinking of you and your mastermind group lately. wondering, have you ever written a post about it? how you selected each other, how often you meet, how you frame your agenda, your “rules of engagement,” how you summarize and archive takeaways of convo, what you are able to implement ‘in the real world,’ and so on. i’m working on creating some scenarios for a junto to post soon, accompanied by images, to get a sense of what the participants’ behavior would look like and how they’d interact with the interface. i’d be curious for your opinion of what would be a seamless kind of flow for that. I just realized this post was written a year ago 🙂 it said July 1st and I assumed it was of this year. I find it very interesting the diagrams used include the “+” symbol but more so what you said almost a year to the date as Google + is rolling out the new tool. I believed I’ve mentioned it before on a different post on this blog, but you might want to check out Fred and MerriLyn Emery’s Participative Work Design philosophy / theory / methodology. It dates from a half-century ago, but the necessary / appropriate principles for online collaboration and learning are all there. Recalling an insight provided by the folks at Manager Tools that role authority can inhibit team function (those who take the field in sports are a team of equals, they depend on each others skills and drill to a level of practically intuitive communication but do not expect the manager or coach to take the field with them). So do teams function best when role authority is applied to assembling and potentiating the capacity of the team to perform but NOT directly participating? Your description of JAD and key roles seems to reinforce the value of that structure (and yet it seems that so often the “boss” or “manager” expects to participate and weigh in – effectively distorting the outcome thru their – well-meaning/controlling? – participation). I appreciate the hard work that was done to create this. I am concerned about the validity and reliability of your findings. Besides your own experience, what literature did you review that supports your findings? Also, what, if any, organizational, management, social or educational theory informed your findings? Sorry, I just re-read your post more clearly. It looks like you have cited a number of sources. Next time I’ll read more slowly before I fire off an asinine comment! My initial reaction to this is that each highly functional collaboration team will be unique unto itself and that no specific organizational structure can necessarily be proscribed ahead of time. In my view, success comes with unplanned and intangible harmony of personalities and desires. Hi Venessa, I very much appreciate your blog. I find it very thoughtful, inspiring and helpful. Thanks again for all the great insights. Greetings from Spain. So glad I found you! What a brilliant creativity you share.. thanks! Pingback: Proyectos Personas Pasiones: La Colaboración en "el mundo de Einstein"
We truly appreciate your blog post. You’ll find a multitude of ways we could put it to great use by means of a minimum of effort with time and money. Thank you very much with regard to helping make the post reply many questions we have come across before now. Thanks for the detailed summary of a book/chapter that I have not read. I’m currently doing some research/writing on structured v. emergent collaboration, and a Google search led me to this post. 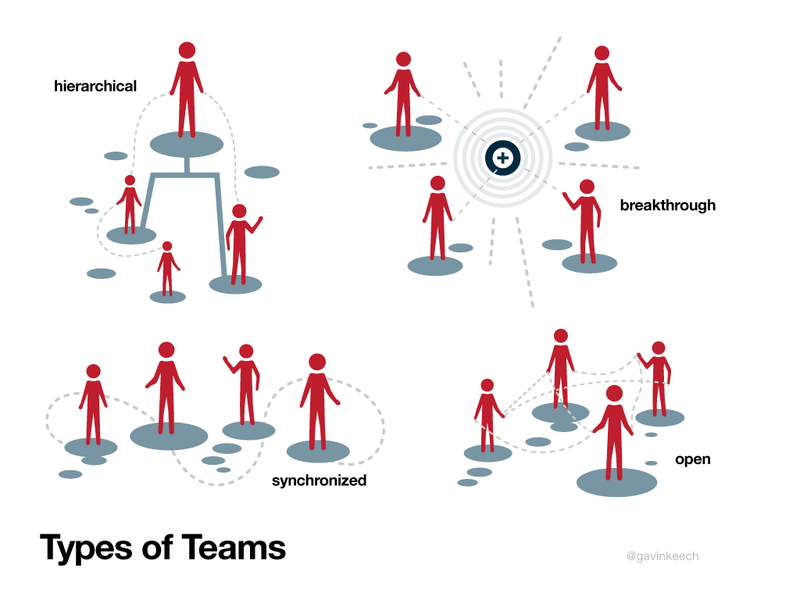 I am interested in learning more about the four types of teams included here (hierarchical, synchronized, breakthrough, and open), but am not clear whose model that is. Is it from Highsmith or Katzenbach & Smith? I’d appreciate knowing so I can dive in deeper and cite the correct source. Thanks! Very very helpful post indeed! 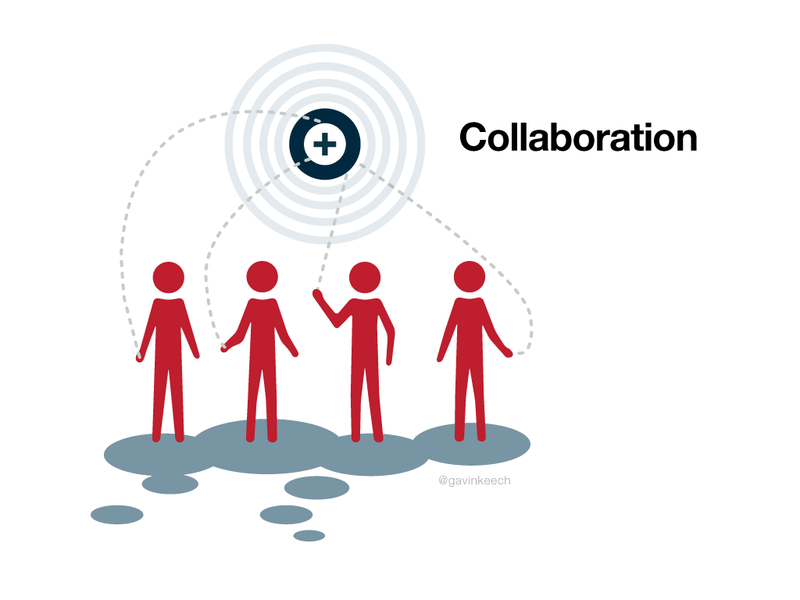 I think collaboration is the most important skill in doing successful business. There’s so much to learn about it. Pingback: Time Capture Park » WHAT IS THIS BLOG?